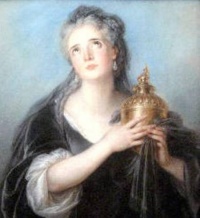 Adrienne Lecouvreur (5 April 1692 – 20 March 1730) was a French actress. Born in Damery, she first appeared professionally on the stage in Lille. After her Paris debut at the Comédie-Française in 1717, she was immensely popular with the public, until her mysterious death. She was credited with having developed a more natural, less stylized, type of acting. She had a romance with Maurice de Saxe, which ended in tragedy when she was apparently poisoned by her rival, Maria Karolina Sobieska, Duchess of Bouillon. The refusal of the Catholic Church to give her a Christian burial moved her friend Voltaire to write the bitter poem, "Sur la mort d'Adrienne Lecouvreur", on the subject. Her life became the inspiration for a tragic 1849 drama Adrienne Lecouvreur by Scribe and Legouvé on which Francesco Cilea's opera Adriana Lecouvreur and the operetta Adrienne (1926) by Walter Goetze are based. Before them, however, in 1856, Edoardo Vera premiered his "dramma lirico" Adriana Lecouvreur e la duchessa di Bouillon. In 1913 Sarah Bernhardt played her in the silent movie Adrienne Lecouvreur. In 1928, MGM Studios filmed Dream of Love, based on the Scribe and Legouvé play, Adrienne Lecouvreur, starring Joan Crawford and Nils Asther. At least six further films were made based on her life including Adrienne Lecouvreur (1938). Unless indicated otherwise, the text in this article is either based on Wikipedia article "Adrienne Lecouvreur" or another language Wikipedia page thereof used under the terms of the GNU Free Documentation License; or on original research by Jahsonic and friends. See Art and Popular Culture's copyright notice. This page was last modified 12:20, 27 March 2014.